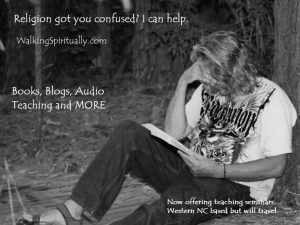 WALKING SPIRITUALLY is on a mission…..
BOOKS, BLOGS, AUDIO, VIDEO—There are many resources on this website that you can take advantage of. Most of them are free or at a very low cost. Take time to explore this website and check back frequently for new resources being added all the time. SEMINARS—Raven is available and willing to speak to your group no matter how big or small. Seminars can be on any level you want from just sitting around a living room or fire to larger more formal speaking engagements. You will find Raven very open-minded and accepting because Raven is pro-human and wishes to help every human being reach their full potential no matter what race, creed, sexuality, gender, etc. SPIRITUAL RETREATS—Raven draws upon his Cherokee heritage and his deep understanding of spirituality and the Bible and can spend time with your group leading you into a spiritual awakening. This may include rites of passage, coming of age ceremony/recognition, sweat lodge, meditation, teaching and discussion. These retreats will fit into christianity or any religious/spiritual background you may have. DRAMA & STORYTELLING—Raven’s theatrical experience adds to his presentations as he offers one man dramas and skits and storytelling ranging from his original stories to stories from many different cultures. He is Cherokee in heritage and draws upon the strong traditions of storytelling to make his presentations fun, interesting and informative. CAMPFIRE CULTURE—Raven loves the outdoors and is considered an expert in primitive, survival and wilderness living skills. Raven is able to take these skills and offer them in a unique way to teach many life lessons. He can also teach your group how to survive and appreciate the outdoors. Be sure and visit our sister site Way of the Raven for complete information if you are actually interested in survival skills. CRAFTS—Raven is a skilled artist and draws upon his abilities to take objects from the wild and craft them into interesting items based upon many of the skills and crafts of early people. He is able to offer many crafts that are fun for all ages, using stone, bone, wood, leather to make jewelry and other useful items. SUMMER CAMPS/DAY CAMPS— Raven is available to bring all his skills and entertainment for a day, for a few hours or an all week camp for any age. OF CHRISTIAN INTEREST—In addition to the above Raven teaches Bible studies, men’s retreats and will even preach a revival. His solid foundation and understanding of the Holy Bible will fit any denominational setting.